Learn here how to fill information ink tanks, follow all the steps and if you have any questions, write a comment. The continuous ink system is a very helpful tool for printers and savings that can be install, learn the system components and use it properly is the most important thing for a long lifetime of the equipment. Know how to supply the ink tanks is important, it depends on the operation of the printer. By putting ink tanks must know how to do to not fill ink cartridges too, this will cause spills ink on the pages to print in the future. 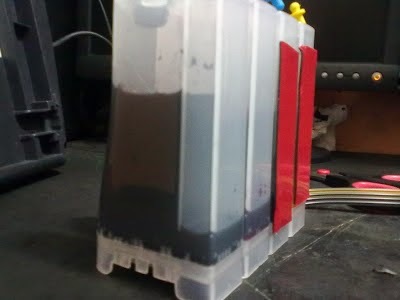 The ink tanks at the top has two holes, one that serves to pull the printer air and another that is used only to fill the tanks when the printer is not printing should close this as it is very broad and can introduce any object or insect and clog the system. The amount of ink that we put the system is necessary to know it, and know how far he can be the ink in the ink system, then present as the ink supply system, which cap the top must open and which should remain clogged. It is always recommended as not to be easy to put the ink tanks make use of a syringe, it is recommended that is not sharp, avoid puncturing the tanks. Avoid putting more ink system that seen in the photo, it is possible that if we put more than one thing you notice in the picture is possible that the ink cartridges are filled with ink that only provoke spills on the pages to print time, when we are putting ink system only leave open the hole where the ink sets, plug the other hole so that it achieves what you see in the picture, that is one side of the system has the ink another this allows the ink to remain static in conjunction with the cartridge. An ink system as we know is an adaptation, know how to take care is very important, is not a tool with help from the ink cartridge to pull, so we recommend that the position of the cartridge system and level height is the same.